Just yesterday, C and I were able to visit the Fair at PNE. 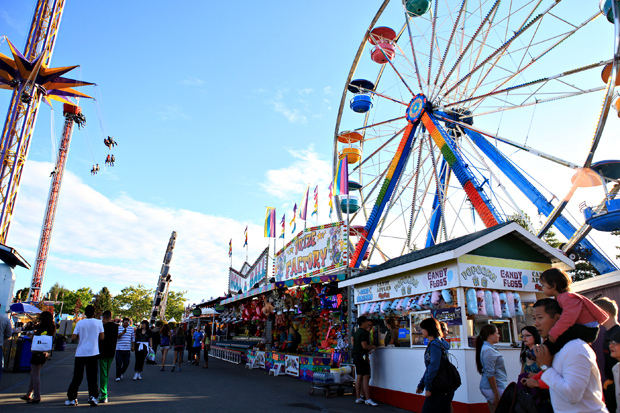 More known as the PNE, the fair is open only two weeks before back to school, and is home to over 50 fun rides, fair vendors, games, activities for both young and young-at-heart's. This year's Fair is open 11AM daily - late at night, from Saturday, August 18 to Monday, September 3, 2012. Different people go for different reasons, such as the summer night concerts and events for music lovers, trade-show type marketplace for shoppers, kids playgrounds for parents and their kids, and whatnot! Some just go because it's always been part of their childhood. Some people go because it's just part of their summer experience, and of course, it's something to do. The attraction is located on Hastings and Renfrew in Vancouver. There's lots of people especially on the weekends and parking can be tough! This year, I went on a weeknight, and it was perfect because street parking was free, and there weren't many crowds. Line-ups for rides could go for an hour! So it's all up to you. Tip #1: My advice is, if you can go on a less busier time, the better! It's actually quite funny because some residential houses would open their driveway up for parking, and they would line up and try to flag you down when you're looking for parking! Playland, where you enjoy the rides and attractions, is open around April to end of September and is extended during the Fair time of the year. I normally don't go on the rides as I'm here to visit the fair more, which includes the Marketplace, Safeway Farm Country, Concert Stage, etc. Going to the PNE isn't free, you can buy tickets onsite or buy them online because they're cheaper that way! The fair is populated with lots of these fun booths, like this one called "Fool the Guesser". The idea is to allow the host to guess your age or weight, and if they're off by a certain margin (I think it's 3 pounds) then, you win a prize! Last year's most notable prize would definitely be the minions from Despicable Me! Don't you think they look so silly? I could almost imagine them making some silly sounds! But C had already given me 3 of these silly stuffed toys, so I wasn't really in any mood for more! But, he did win me an adorable karate Domo-kun! YAY! And just as if Angry Birds craze hasn't ended just yet - here's a real life Angry Birds game! 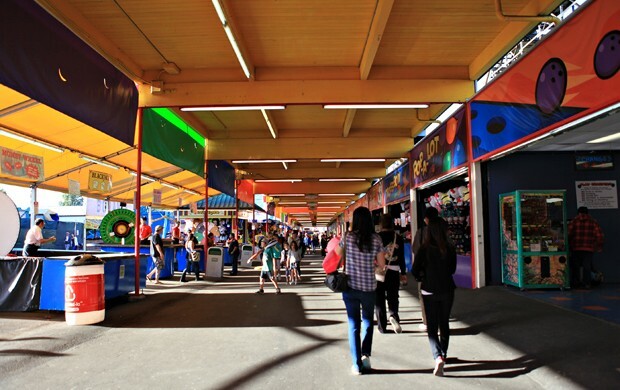 Going to the PNE is always a bright and colourful experience! Rides, prizes, and of course food! They also have a showdown of BBQ places, as you can see below. Most of these places would even display all their awards they have received for their BBQ! I can't remember which one this is - but I mean, you can't go wrong with a pulled pork sandwich with potato salad! The PNE is never complete without mini donuts! This place sells them for a deal (at least I think so!) It's $5 for two bags! More sugar high! And to be honest, I couldn't help but watch those cute donuts go through the tiny production line right before I get to eat them - FRESH! Along with mini donuts, the Fair is also populated with even more of these carnival food like cotton candy, deep fried mars bars, sno cones, and even more unhealthy food that just taste sooo good! I'm always so fascinated with the bright and giant signs of the food stalls at the PNE. Tell me if this doesn't grab your attention. It's HUGE! This visit, I tried out La Poutinerie, which sold delicious poutine! C and I tried the Italian one, which is poutine + tomato sauce and peperoni! Yummy! And that's it for my post for PNE! I really go there for the atmosphere, mini donuts, and prizes. I'm sure your experience would be different, especially if you're all about the rides, the shows and the concerts. It's only going to be open for a little over a week, so don't miss this fun summer activity! Check their site for more details.